Set up your Christmas table much as you would every year. If you do it formal with a lace table cloth and your best China-do that this year as well. Or pull out some suggestions from the last two weeks' fiestas. For our FIESTA DE NOCHE BUENA we'll be serving up Chimayo Cocktails and Steaming Hot Apple Cider. For the main meal, we'll make an easy-to-serve-yourself buffet of Chile Rellenos, Menudo or Pozole, Beef Tamales and Mexican Rice. We'll leave out dessert-it's bound to be late by the time everyone finishes opening presents and eating-especially if the kids have been sneaking candy canes off the tree or been taking whacks at a pi�ata! You can make these ahead of time and refrigerate. The apple cider used in this authentic but little-known Mexican cocktail makes it perfect for Noche Buena. This recipe serves eight. If you want to make it less potent, use less tequila and more apple cider (to taste). To serve it hot, leave out the ice cubes, double the amount of apple cider and heat to nearly boiling in a saucepan, pour into cups and garnish with apple wedges. Fill a blender with ice cubes. Add tequila, creme de cassis, cider and lemon juice. Shake well and strain into eight glasses. Add the ice cubes and garnish each glass with an apple wedge. This recipe takes less than ten minutes to make, and is a real tummy warmer on a cold Christmas Eve! Just have everything ready to assemble before your guests arrive! Combine the cider, cinnamon, cloves, allspice berries and Orange peel in a large saucepan and heat. Simmer about 5 minutes, or until the flavor of the spices and Orange peel are infused into the cider. Pour into mugs and serve immediately, garnished with sliced Orange. We're offering up two ways to do this dish. The first way uses fresh chiles. It is authentic, but time-consuming. The second way uses canned chiles and takes a whole lot less time. It's still certifiably delicious, however! Allow yourself a good half hour to prepare these rellenos, and solicit the help of a dear friend or family member so that your job is easier. Recipe serves eight. Rinse the chiles. Preheat your oven to broil. Place the chiles in a 9 x 14 baking dish and place on the top shelf of your oven. Watch and listen closely. When the skins start to make popping sounds and to char and turn black in places, take the chiles out and flip them over. Be sure and use a potholder so you don't burn your hands! When both sides are fairly evenly charred, remove them from the oven. Wrap each chile in a moist paper towel or place in a sealed plastic bag to steam. After a few minutes, check them. Once the skin comes off easily, peel each chile. Cut a slit almost the full length of each chile. Make a small "t" across the top, by the stem. Pull out fibers and seeds (this is where the heat is) and replace with a slice of cheese. You can set these aside, for a few minutes or a few hours if you put them in the refrigerator. Heat the oil in a skillet until a drop of water sizzles when dropped into the pan. Beat the egg yolks with one tablespoon flour and salt. Mix the yolks into egg whites and stir until you have a thick paste. Roll the chiles in flour and dip each one in the egg batter. Coat evenly. Fry, seam side down on both sides until golden brown. Place on paper towels to drain. Meanwhile, heat the salsa in a medium saucepan (either one or some of each). 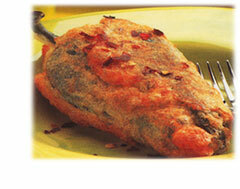 Place one or two Rellenos on each plate and pour salsa over them. Serve them immediately and brace yourself for major compliments! This is a basic, easy recipe for Tamales. There are so many variations on these you would be amazed. 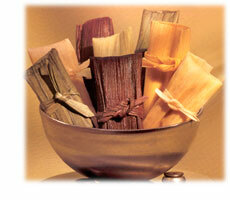 While they are traditionally wrapped in corn husks, you can also wrap them in banana leaves. They can be made with most any kind of meat or vegetarian fillin. You can even make fruit tamales for dessert! You can make these ahead of time-even a few days ahead of time. They refrigerate well. Be sure to begin steaming them about an hour before you're ready to sit down and eat. This delicious recipe t will delight your friends and family. Be sure to serve with some salsa fresca on the side for those who love to spice things up a little! Serves eight. Early in the morning (up to a few days before Christmas), place the roast and water into a large pot or crockpot and slow cook four to six hours, or until it shreds easily with a fork. Remove the meat from pot. Place in large bowl, add salt and shred, reserving broth for the masa and the filling. While Menudo is a traditional Mexican soup that claims to be the nation's number one cure for hangovers (or whatever else ails you! ), not everyone can deal with the fact that it's made from tripe. That's okay. There are alternatives, such as Pozole, which is essentially the same soup, but made with chicken and pork in lieu of tripe. In a large Dutch oven or crockpot, place first nine ingredients. Heat to boiling and then cover and simmer for four to six hours. Add hominy and salt and pepper to taste. Cover and cook an additional hour. 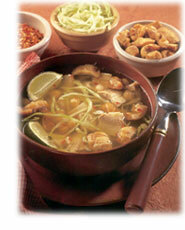 To serve, place each garnish in a little bowl and let everyone add whatever they want to their bowls of soup. Sit down and chow down! This traditional Mexican side dish is super easy to make and always tastes good. If you're using brown rice, allow about 20 minutes to prepare. If using Minute Rice, it'll take you a lot less time! Serves eight. In medium sized saucepan bring two cups water and salsa to boil. Add brown rice. Stir well. Cover, reduce heat and simmer for 15 to 20 minutes until fluffy. Add salt to taste. Serve immediately.